We the undersigned petitioners ask Peabody to keep and convert the front parts of 22 & 24 Underwood Road as a small but important remnant of the former Jewish Maternity Hospital and as a memorial to the pioneering achievements of Alice Model MBE. On Tuesday, 20 December 2011, we issued a Newsflash containing the full text of Stephen Howlett’s reply to Tom Ridge‘s letter of 16 December 2011. Here is Tom Ridge’s reply of 21 December 2011. After you have read all three letters we feel sure that you will want to write in support of the Campaign’s request for a meeting with Peabody and Tower Hamlets Council. Please write to Stephen Howlett ([email protected]), and send copies to Owen Whalley ([email protected]) and the press. Thank you for your e-mail of 20 December, in which you neither accept nor reject my recent request to meet with you and Tower Hamlets Council to reach an amicable settlement, as suggested by the Minister for Tourism and Heritage. As was evident at Peabody’s public consultation meeting on 7 November 2011, there are probably more objectors than supporters living in the vicinity of your proposed scheme. We do not doubt that your interest in the site has always been to provide the “maximum amount of affordable homes”. However, of the 33 proposed homes only 9 are for affordable rent, whilst 11 are for shared ownership (which is beyond the means of families living in “B&Bs and hostels”) and 9 for sale on the open market. Your so-called “options for retaining the existing buildings” were only “explored” as a response to the campaign to save the two cottages. Furthermore, they were “explored” by architects utterly convinced of the superiority of their proposed new buildings. And not by independent architects, as offered by Will Palin of SAVE Britain’s Heritage – an offer made in an e-mail to you, which you failed to even acknowledge. You say that retaining the two cottages would result in the loss of “six 3 or 4-bed family homes with private gardens for social rented tenants”. But, on the plans which I have seen, the only “homes with private gardens” are along the south boundary and separated from the cottages and your five-storey block on Underwood Road by an extensive area of well-planned amenity space. Your e-mail also ignores the fact that the campaign is proposing the retention of the two cottages as two family homes, which would be a living memorial to a unique maternity hospital. This is not, therefore, a simple case of prioritising the needs of some of the poorest people in London “above the retention of bricks and mortar”. You also ignore the fact that the “bricks and mortar” are now “non-designated heritage assets, in accordance with PPS5”. And that it is for this reason that the Labour Group motion (unanimously voted for at the Full Council Meeting on 29 November 2011) stated that Peabody has a duty to provide affordable homes and respect the Borough’s heritage. English Heritage did not decide that the buildings “lack sufficient architectural merit to be retained”. It decided that the buildings lacked sufficient architectural interest to be listed. Furthermore, it described the former Jewish Maternity Hospital as a “rare Jewish welfare building in London’s East End”. We are not opposed to the accurate commemoration of the former Jewish Maternity Hospital. But we also believe that, as the largest and possibly most important of the three surviving former Jewish welfare buildings in London’s East End, its two smallest buildings must be retained as valuable built evidence of the Jewish East End and the fact that the East End is renowned as a historic point of arrival for migrants from all over the world. There is no substitute for a proper bricks-and-mortar memorial which is also two much-needed homes for families needing a place to call home. On behalf of the 760 or so signatories to the petition, I therefore renew my request to meet you and Tower Hamlets Council to achieve the amicable settlement suggested by the Minister for Tourism and Heritage. And also ask that, as this meeting is likely to be in the New Year, you instruct your demolition contractors to secure the loose tarpaulins on the cottage at 24 Underwood Road and ensure that rainwater is being shed away from the building. Also, please instruct them to leave the cottages when they resume work. Thank you for your e-mail of 16 December 2011. Peabody understands that there are many people who would like us to retain the cottages. There are also many others who are supportive of the scheme, particularly those who live closest to the building and will be most affected by our works. Peabody is a charity which has relieved poverty in London throughout its 150-year history. Our interest in the site has always been to provide the maximum amount of affordable homes. This is fundamental to our purpose. As you no doubt know this was the basis on which the Borough agreed to sell us the site. We have explored a number of options for retaining the existing buildings but none are feasible as they would limit both the number of new homes and the layout of any new residential development. Through retaining the two cottages there would be a loss of seven homes. Six of these homes are 3 or 4-bed family homes with private gardens for social rented tenants. These homes will help alleviate the severe housing shortage in Tower Hamlets and enable families currently living in unsuitable temporary accommodation such as B&Bs and hostels to have a real home. I have written personally to Lord Janner and have explained this position to him. Alice Model MBE dedicated her life to helping those less fortunate then herself. It is our sincere hope that were she alive to today, she would understand that supporting the needs of some of the poorest people in London must be prioritised above the retention of bricks and mortar. English Heritage has decided that the buildings lack sufficient architectural merit to be retained. It is the social history of the site that is recognised as being significant and the social history that will be celebrated through our completed development. This will be achieved both through our design and the way the history is commemorated but also by virtue of the fact that this neglected site will once again help the local community by providing much-needed affordable homes in Tower Hamlets. In time the new homes we build here will become part of London’s heritage too, and part of the continuing story of this area of the East End. Peabody is committed to working with the local community to ensure that a sensitive and appropriate memorial is realised. Should you wish to be involved in this process we would welcome your contribution. While I appreciate that a memorial is not the building you would like to keep, there is no substitute for having a place to call home. This is the situation facing many families in London and it is for this reason that the buildings will be demolished. Further to the 14 December letter from Dr. Sharman Kadish, and on behalf of the 760 or so signatories to the petition, I formally request that you meet with campaign representatives and Tower Hamlets Council to achieve the amicable settlement, as suggested by the Minister for Tourism and Heritage. We look forward to meeting you early next week, bearing in mind the unanimous decision by Tower Hamlets Councillors at their full council meeting on 29 November. Also Councillor Rabina Khan’s 1 December letter to you as Lead Member for Housing. And Lord Janner’s 12 December letter to you in support of the Campaign, in which he looks forward to hearing from you that the cottages have been saved. Would you also, as a matter of extreme urgency, please instruct your demolition contractors to secure the tarpaulin on the cottage at 24 Underwood Road and ensure that rainwater is being shed away from the building. Also, please instruct them to leave the cottages when they resume work. Following the unanimous decision by Councillors at the Tower Hamlets Council meeting on 29 November 2011 (press release 30 November), Cllr. Rabina Khan wrote to Peabody’s Chief Executive, Stephen Howlett. She informed him of the decision and pointed out that the cottages were now non-designated heritage assets and, in accordance with PPS5, her officers had a duty to protect them. Peabody should, therefore, alter their Option 3 plans so that each cottage is converted to a family home. has changed”. He then referred to the English Heritage decision not to list the buildings and clearly thinks that this means that they can be demolished, regardless of their new status. He must stop using the 2010 refusal to list as a justification for demolition and accept the fact that English Heritage described the former Jewish Maternity Hospital as a “rare Jewish welfare building in London’s East End“. Also that the Council’s 17 October 2011 recognition of the buildings as “non-designated heritage assets in accordance with PPS5” means that their retention is now a material consideration in planning terms. And that Peabody has a responsibility to at least retain and convert the two cottages. On 8 December, campaign representatives met with one of the Mayor’s advisors. And on 12 December, Lord Janner of Braunstone QC wrote to Stephen Howlett saying that he would be grateful to know that the cottages have been saved. We understand that Lord Janner fully supports the campaign and is working to help achieve its aims. Dr. Sharman Kadish, the Director of Jewish Heritage UK, wrote to Stephen Howlett on 14 December with a copy of a letter from the Minister for Tourism and Heritage. John Penrose MP suggested “engagement between the Campaign, Tower Hamlets Council and the developers, Peabody Housing Trust, for an amicable settlement”. Dr. Kadish suggested to Stephen Howlett that we take this advice and reach a settlement. On 16 December, Tom Ridge wrote to Stephen Howlett on behalf of the 760 or so signatories to the Campaign’s petition, formally requesting that he meet with campaign representatives and Tower Hamlets Council, as soon as possible. Later the same day, we received an email from Tower Hamlets Head of Planning, Owen Whalley, saying that he had written to Peabody asking for a meeting “to further discuss the retention of the cottages”, and that Stephen Howlett had agreed to meet and a date is being finalised. On Wednesday evening, 9 November 2011, Owen Whalley, Head of Planning and Building Control, met with Cllr. Robina Khan (Lead Member for Housing), Cllr. Alibor Choudhury, and local residents Tom Ridge, Brenda Daley and Melissa Parker. We are grateful to Cllrs. Khan and Choudhury for arranging the meeting and to Owen Whalley for agreeing to meet us. Following a review of events since 2008, Owen confirmed that he and his colleagues are dealing with the four buildings on Underwood Road as non-designated heritage assets. It was agreed that various letters would be written to Peabody Housing and English Heritage, and that we would meet again on Wednesday, 16 November 2011. We met with Cllr. Rabina Khan on Wednesday evening, 16 November 2011 and reviewed progress. We are still waiting for the news item on the Council’s website to be suitably amended. And we are still hoping that Peabody Housing and the Council will inspect the tarpaulin sheeting over the roofless building to ensure that rain water is drained away from the building. We understand that Peabody’s architects Brady Mallalieu are redesigning their proposed new building to see if it can incorporate the two ‘cottages’ at 22 and 24 Underwood Road. However, there are still numerous issues to be resolved and we hope that Tower Hamlets Council will continue working with Peabody to ensure the retention and conversion of the two non-designated heritage assets as part of a housing scheme which provides the right balance of housing for rent, shared ownership and sale. There is also a possibility that after Peabody has met with Cllr. Rabina Khan they will meet with representatives of the Campaign. On 29th November we are presenting the Peabody Petition to the full meeting of Tower Hamlets Council. So far about 650 people have signed the petition (including hard copies). To achieve our target of 1000 signatures please encourage more people to sign the onlne petition. The Peabody public consultation event at the Osmani Centre on 7 November was well attended by members of the Campaign seeking to save the two ‘cottages’ at the former Jewish Maternity Hospital in Underwood Road. Dr. Sharman Kadish, the Director of Jewish Heritage UK, came all the way from Manchester. Other attendees included Cllr Rabina Khan (Lead Member for Housing) and Cllr. Alibor Choudhury, also Cllrs. Bill Turner and Joshua Peck. We were also very pleased to meet 86-year-old Stanley Fox from Wembley, who was born in the Jewish Maternity Hospital and has played a key role in the campaign to save the two ‘cottages’. Mr. Fox and local residents Brenda Daley and Melissa Parker, in the presence of Cllrs. Khan and Choudhury, presented our petition to Matthew Bird of Peabody. In addition to online signatures, many local residents and others at the event signed our petition, which now has just over 600 signatures. Peabody comment forms were also filled in and we suspect that most of them expressed anger at Peabody’s illegal partial demolition of the most attractive and historic of the two ‘cottages’ (see Campaign Newsletter No. 6) and demanded the retention and conversion of the two ‘cottages’. The demolition contractors were on hand to apologise for starting the demolition before getting clearance from Tower Hamlets Building Control (see Campaign Newsletter 6). It was put to them that, as Angela Brady was going back to the drawing board, it would be helpful for the demolition contractors to leave the ‘cottages’ when they resume demolition. They agreed to do this subject to direction by their client, Peabody Housing. Unfortunately, the officers present were reluctant to give a firm commitment in these matters. Not surprisingly, Peabody have selected references from English Heritage’s letter of 23 April 2010 which justify their demolition of the only former Jewish maternity hospital in England. Perhaps under Angela Brady’s guidance, they will re-read the letter and find the following statement: “The building (22-28 Underwood Road) has a claim to historic interest, as one of the few surviving buildings relating to the work of Alice Model and as a rare Jewish welfare building in London’s East End.” (see Campaign Newsletter No. 7). 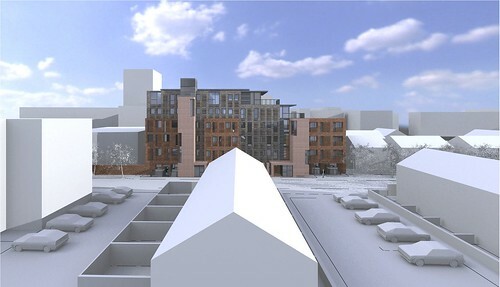 The Campaign also thinks that now that the Council has recognised that the buildings “represent a non-designated heritage asset in accordance with PPS5”, Owen Whalley, Head of Planning, should be instructing Peabody to respect the four heritage assets on Underwood Road and include them in a revised proposed residential redevelopment, as required in the Council’s 2008 planning statement for 22-28 Underwood Road. PEABODY IS MAKING SELECTIVE REFERENCES TO ENGLISH HERITAGE’S LETTER OF 23 APRIL 2010. THESE REFERENCES ARE REPEATED IN A TOWER HAMLETS COUNCIL NEWS STATEMENT OF 4 NOVEMBER 2011 ABOUT THE FORMER JEWISH MATERNITY HOSPITAL. THIS STATEMENT PUTS THE REFERENCES IN CONTEXT, OUTLINES THE SIGNIFICANCE OF THE FOUR BUILDINGS ON UNDERWOOD ROAD AND EXPLAINS WHY TOWER HAMLETS COUNCIL IS OBLIGED UNDER PLANNING POLICY STATEMENT 5 TO DO ALL IN ITS POWER TO SECURE THEIR RETENTION AND CONVERSION. English Heritage’ statement about the former Jewish Maternity Hospital not being a unique instance of Jewish welfare provision in the East End was partly based on their incorrect assumption that the listed Albert Stern House in Mile End Road was a ‘hospital and alms houses for Sephardic Jews’. In fact, it was opened in 1913 as an old people’s home. This means that, following the demolition of the London Jewish Hospital (Stepney Green), the former Jewish Maternity Hospital in Underwood Road is the only surviving former Jewish hospital in the East End. In addition to these listed early C20 purpose-built examples, there is the existing mid-C20 Stepney Jewish (B’nai B’rith) Club and Settlement in Beaumont Grove. This includes the Alice Model Nursery and an old people’s home. 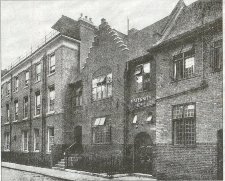 The other ‘instance(s)’ mentioned by English Heritage in connection with Alice Model are three surviving C19 houses: two accommodated her Jewish Day Nursery and the third was used as the Sick Room Helps’ Society maternity nurses’ home from 1906 to 1911. This tall, three-storey terraced house was built ca. 1939 on the London Hospital Estate and is Listed Grade II. The only purpose-built buildings in Tower Hamlets directly associated with Alice Model are the buildings at 22-28 Underwood Road. Furthermore, this was not a Jewish maternity hospital as stated by Peabody, it is the only surviving former Jewish maternity hospital in England – a fact which was totally ignored by English Heritage. The four buildings on Underwood Road may well have ‘negligible architectural interest’ for English Heritage. But this does not mean they have little or no architectural interest. They are a unique and attractive group of buildings of sufficient interest to be briefly described in the Pevsner Architectural Guide, London 5: East, page 423. Just because the buildings are not nationally or locally listed nor in a conservation area does not mean that they do not make a valuable contribution to the character and appearance of the local area and to Tower Hamlets as a whole. The building (22-28 Underwood Road) has a claim to historic interest, as one of the few surviving buildings relating to the work of Alice Model and as a rare Jewish welfare building in London’s East End. NB: For further details on non-designated heritage assets, see my second Open Letter to Owen Whalley October 12. 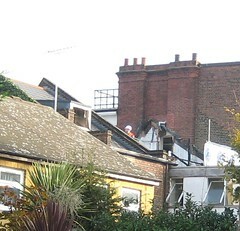 Despite a written assurance to Dr. Sharman Kadish that they would not start demolition before the public consultation on Monday 7 November, and without submitting a demolition notice to Tower Hamlets Council, Peabody’s contractors have started to demolish the oldest and most attractive of the two ‘cottages’. The entire roof and stepped gable have been removed and machines have started devouring the brick walls behind the scaffolded front walls. It was obvious that Peabody was doing all in its power to stop any normal democratic ‘debate’ about keeping the two ‘cottages’. But their preemptive and deliberate destruction of the 1911 ‘cottage’ at 24 Underwood Road is an insult to the people of Tower Hamlets and to the memory of all the people associated with the former Jewish Maternity Hospital. The 1911 ‘cottage’ has lasted 100 years and would have lasted another 100 years, but Peabody has chosen to destroy this attractive and unique little building in the very year of its onehundredth anniversary. Clearly, Peabody intends by this appalling and illegal act of gross cultural vandalism to make sure that there will be little or no point in our trying to save the ‘cottages’ at their public consultation on Monday 7 November. However, thanks to Mayor Rahman and Councillors from all four political groups, Owen Whalley wrote to Peabody on 3 November urging them to stop demolition. Peabody’s contractors have stopped work but will resume after Monday 7 November. They will not say when that will be but we suspect that it could be by the end of next week. We must, therefore, fight on to save the ‘cottages’. Nearly six hundred people have now signed the online petition to keep the two ‘cottages’ and we will present this petition to Peabody on Monday 7 November at about 5.30 pm. Arrangements are also being made for us to present the petition to a full meeting of Tower Hamlets Council on 29 November 2011. So, even after 7 November, please sign and encourage others to sign the petition for presentation to the Council on 29 November (www.residents-first.co.uk). Our thanks to all those who have already signed the petition, especially Sir Arnold Wesker (born JMH 1932) and Councillors from all four political groups. Our thanks also to those who have written to Peabody, especially Dr. Sharman Kadish, Director of Jewish Heritage UK; the chairs of the East London History Society and the Jewish East End Celebration Society; Tower Hamlets Councillor Bill Turner, the Secretary of SAVE Britain’s Heritage; and Tower Hamlets Councillor Rabina Khan (Lead Member for Housing). as a memorial to all the doctors and nurses who worked there and all the people born there between 1911 and ca. 1940. The above image from the Peabody website 20 October is an ‘artist’s representation’ of their proposed new development on the cleared site of the former Jewish Maternity Hospital. 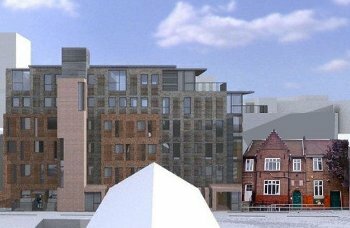 It appears to show the north side of a six-storey block, which ‘will provide much needed affordable homes for local people while also commemorating a neglected piece of local history’. The accompanying text states that, after the public consultation event on 7 November (see Campaign Newsletter No. 4), they will submit their planning application and demolish the existing buildings. This suggests that their planning application will be for demolition of the existing buildings and the erection of a replacement building. And that the application for demolition and replacement will be granted planning permission after a public consultation and approval by a committee of councillors. In fact, after the event on 7 November, Peabody are ‘proposing to begin demolition prior to the submission of the planning application‘ for their five- or six-storey replacement building (13 October letter from Peabody to Dr. Kadish). Peabody can do this because they avoided the normal democratic process by applying for ‘prior notice of demolition’. They did this knowing that as an Environmental Impact Assessment (EIA) would not be required in this case, the proposed demolition would be what is called ‘permitted development’ and officers would simply have to give ‘prior approval of the method of demolition’. The Council’s EIA officer issued a thorough Screening Opinion on 17 October, which concludes that an EIA was not required. But states that ‘The Council acknowledges that the buildings do represent a non-designated heritage asset in accordance with PPS5‘ (see second Open Letter to Owen Whalley October 12). This was followed on 18 October by a delegated officer report, which concludes that prior approval is given subject to the demolition being carried out ‘in accordance with the submitted methodology’. The report also mentions the receipt of 18 letters referring to the historical and townscape interest of the buildings. And requesting that the Local Planning Authority ‘should secure the retention of the existing buildings’. TOWER HAMLETS HAS NOT GIVEN PEABODY PERMISSION TO DEMOLISH THE BUILDINGS: OFFICERS HAVE BEEN OBLIGED TO ACKNOWLEDGE THAT THE DEMOLITION AT 22-28 UNDERWOOD ROAD CONSTITUTES ‘PERMITTED DEVELOPMENT’ AND HAVE GIVEN ‘PRIOR APPROVAL OF THE METHOD OF DEMOLITION’. PEABODY HAS STILL GOT TO SUBMIT A DEMOLITION NOTICE TO TOWER HAMLETS BUILDING CONTROL. PEABODY COULD STILL DEMOLISH THE OTHER BUILDINGS AND LEAVE THE TWO ‘COTTAGES’ FOR CONVERSION TO FAMILY HOMES. Please do your best to attend the Peabody consultation event at the Osmani Centre 7 November to demand the retention and conversion of the ‘cottages’ at 22 & 24 Underwood Road (see Campaign Newsletter No. 4 and latest Peabody web post. 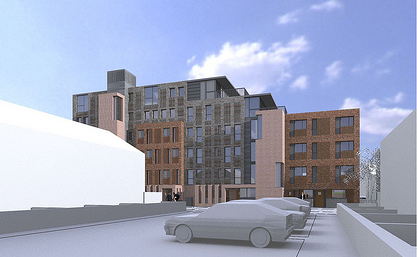 Peabody are currently finalising plans for a residential housing development at 22-28 Underwood. On 25th July 2011 a meeting was held to discuss our initial proposals. Since that time our design has progressed. We would therefore like to invite you to a consultation event to view our latest proposals and raise any questions or concerns that you may have. The event will be held at The Osmani Centre, Community Hall 2, 58 Underwood Road, E1 onMonday 7th of November from 3pm to 7pm. It will be a drop-in event so please come along for as little or as long as you want. Plans and sketches of the proposals will be available for you to view, and staff from Peabody and the project architects will be on hand to explain the proposals. Peabody is one of London’s leading housing providers, owning and managing approximately 19,000 homes in the capital. We manage a range of tenures including social housing, shared ownership, leasehold, and key-worker housing. Peabody is committed to building and developing good quality, environmentally sustainable, affordable homes that foster economic and social regeneration, and engaging with our residents and the community to provide support services that reflect their needs. If you are unable to visit the exhibition we will also be providing the development proposal documents online at www.peabody.org.uk – you can then make your comments to us by telephone, email or post. If you have any questions regarding the exhibition or the proposed development please contact me on 020 7021 4834 or by email at [email protected]. and Underwood Road – see map here). just because they were not sufficiently grand to be listed by English Heritage does not mean that they have little or no architectural interest. The four buildings on Underwood Road constitute a unique and attractive group of buildings, especially the two ‘cottages’. (see second open letter to Owen Whalley 12 October). but point out that this would not be a substitute for at least retaining and converting the two ‘cottages’ as part of the scarce built evidence of the Jewish East End and of the fact that the East End is renowned as a historic point of arrival for migrants from all over the world. Peabody could still demolish the other buildings but leave the two ‘cottages’ for conversion, and alter their plans and planning application accordingly. Between now and 7 November, please sign and encourage others to sign the online petition and write to Peabody’s Chief Executive (see Campaign Newsletter No. 3).